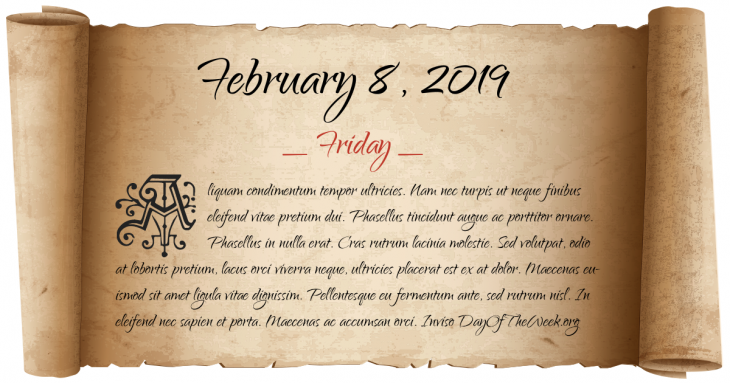 What Day Of The Week Was February 8? Seventh Crusade: Crusaders engage Ayyubid forces in the Battle of Al Mansurah. Robert Devereux, 2nd Earl of Essex, rebels against Queen Elizabeth I – the revolt is quickly crushed. The Supreme Privy Council is established in Russia. Capital punishment: The first state execution in the United States by gas chamber takes place in Nevada. World War II: The United Kingdom and Canada commence Operation Veritable to occupy the west bank of the Rhine. The Government of Sindh abolishes the Jagirdari system in the province. One million acres (4000 km²) of land thus acquired is to be distributed among the landless peasants. The regime of Prime Minister of Iraq, Brigadier General Abdul-Karim Qassem is overthrown by the Ba'ath Party. Allende meteorite falls near Pueblito de Allende, Chihuahua, Mexico. New Year’s Day in Chinese calendar. Start of the year of the Wood Rabbit in Chinese astrology. Who were born on February 8?